Alica Vikartovska (Welwardová) received her PhD. degree in biochemistry at the Institute of Chemistry, Slovak Academy of Sciences (Bratislava, Slovakia) in 1998. Since 1990 she works at this Institute in the following areas: characterisation of immobilised biocatalysts using thermal biosensors, encapsulation of cells and enzymes, biospecific adsorption of the glycoenzymes on immobilised lectins etc. 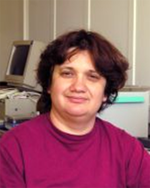 She has published about 35 scientific articles, reviews and patents with current Hirsch index h=12 (Thomson Reuters). Šefčovičová J, Vikartovská A, Pätoprstý V, Magdolen P, Katrlík J, Tkáč J, Gemeiner P: Off-line FIA monitoring of D-sorbitol consumption during L-sorbose production using a sorbitol biosensor, Analytica Chimica Acta 644, 68-71, 2009. Mislovičová D, Turjan J, Vikartovská A, Pätoprstý V: Removal of D-glucose from a mixture with D-mannose using immobilized glucose oxidase, Journal of Molecular Catalysis B: Enzymatic 60, 45-49, 2009. Mislovičová D, Pätoprstý V, Vikartovská A: Enzymatic oxidation and separation of various saccharides with immobilized glucose oxidase, Applied Biochemistry and Biotechnology 162, 1669-1677, 2010. Bučko M, Mislovičová D, Nahalka J, Vikartovská A, Šefčovičová J, Katrlík J, Tkac J, Gemeiner P, Lacík I, Štefuca V, Polakovič M, Rosenberg M, Šmogrovičová D, Švitel J: Immobilization in biotechnology and biorecognition: from macro- to nano- scale systems, Chemical Papers 66, 983–998, 2012. Bertok T, Klukova L, Sediva A, Kasak P, Semak V, Micusik M, Omastova M, Chovanová L, Vlček M, Imrich R, Vikartovska A, Tkac J: Ultrasensitive impedimetric lectin biosensors with efficient antifouling properties applied in glycoprofiling of human serum samples, Analytical Chemistry, after revision, 2013.